At first you might think that how can one wear gold jewellery with western outfits but then, coming to think of it… Don’t you see the fusion trend is up all around you? Be it music, makeup or fashion…it’s got it all. 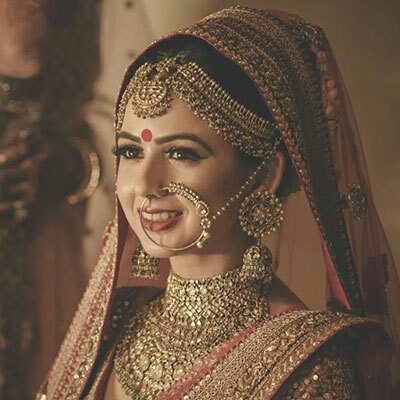 Earlier (like till about 5-6 years ago) women used to wear their traditional gold jewellery with lehengas, kurtis or anarkalis, that too at exclusive events like weddings, engagement etc. because that’s where all the ladies used to gather and judge each other’s gold jewellery. But all of that is so passe. There is something so exciting about teaming Indian gold jewelry with western outfits. 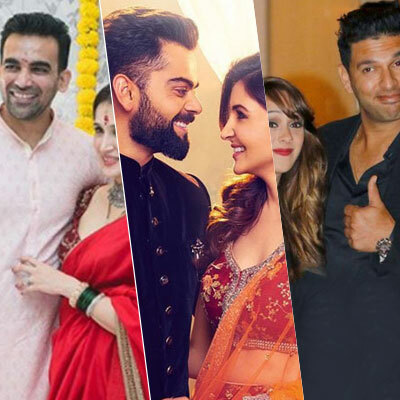 Have you seen that even celebrities have been seen adorning this style trend with full tashan! Indian fashion today has taken itself to new heights with interesting patterns, classic jewelry designs, and fusion inspired looks. 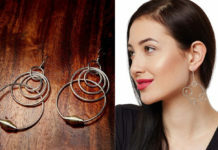 Women these days love flashing their stunning jewelry by pairing it with elegant pieces with some amazing western wear. 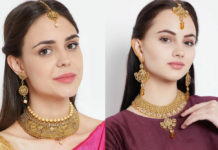 If you are someone who has been always proud of India’s rich culture and wish to style desi jewelry with contemporary clothing in such a way that you rule the fashion scene, then here is how you can do that! 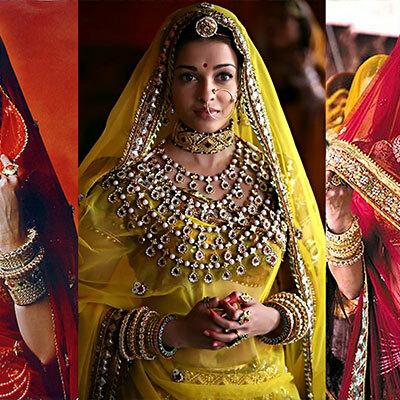 Gold bangles, antique wedding jewellery, kundan combined with gold, statement earrings and many more styles of ethnic jewellery all make a splash with solid colored western outfits. We just decoded some trending looks for you to follow, so that you may ace this tricky style with ease. Bangles have always been a part of our traditional wedding jewellery. Create a chic look by pairing colorful traditional bangles with monochromatic dresses. You can even pair them up with ripped jeans and a smart crop top to add that oopmh factor to your western wear. You know that indo-western glam is all about adding a little bit of bling to an otherwise plain outfit. 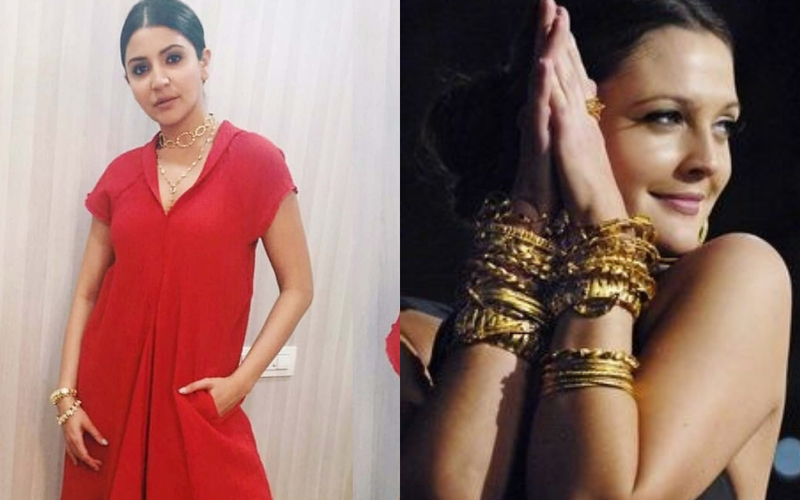 For example, here the stylist for Anushka Sharma has accessorized her fiery red dress so well, that adding a kada or a few polki bangles to her plain outfit has freshened it up! A word of caution though- Don’t go overboard with the bangles or else you may look too wannabe. Gold bangles need to be styled perfectly and in the right manner. You can wear those sophisticated gold bangles that your mom has. You can either stack two-three such bangles on one hand or wear just a single bangle. Another trick is about complementing blue jeans and a crisp white shirt with stunning gold bangles. A crisp white shirt never goes out of style, when paired with a gold necklace it looks super edgy. You could add a gold bracelet for a more detailed look. It is appealing as its unique and different from the usual way of accessorizing. Imagine a collared white shirt and a good ol’ sone ka haar … it can never go out of vogue. We spotted Anushka Sharma pairing her shirt with a lehenga skirt with gold jewellery but you can totally switch it up and wear jeans, palazzos instead. This look is the perfect mix of nailing the Indo-western trend right! 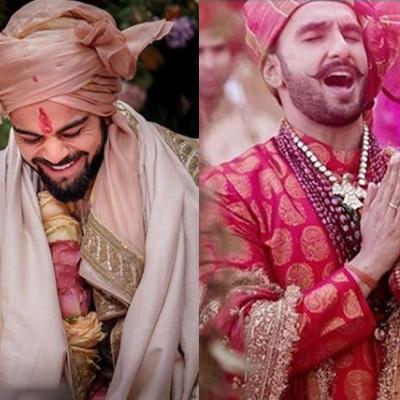 If you thought maangtikas have been the pride of the brides, you are wrong! not anymore! 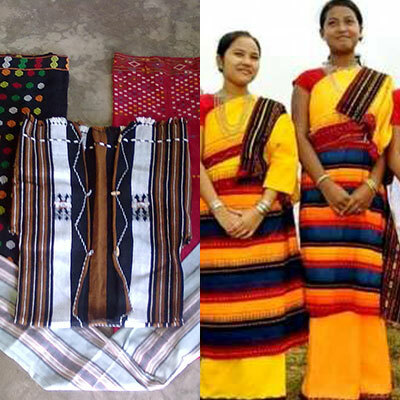 Today, you get a wide range of traditional maangtikas that can even be worn with western outfits. From maangtikas you can differ to bracelets and even the spectacular Nawabi side-swept style paasa. If you have a cocktail party, sangeet or any informal occasion to attend, then you can sport a stunning chandelier maangtika with a gown and be a real charmer. Try and avoid looking overflowy with fusion fashion trends, for this, you need to skip the necklace and the earrings when styling your western outfit with a maangtika and you will look like a diva! As we told you, Bracelets are also a good option to quirk up and give an Indian touch to your western outfit which in turn enhances your persona. 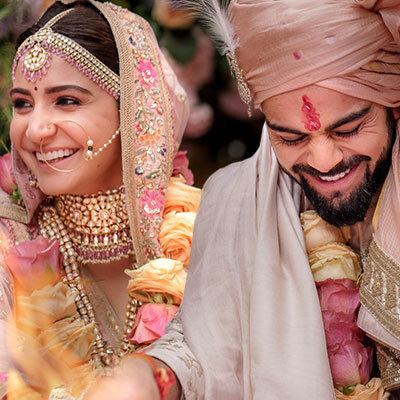 So now you don’t need to wait for a shaadi to wear a maangtika. Wear it to your college festival, or even a birthday party without looking OTT. 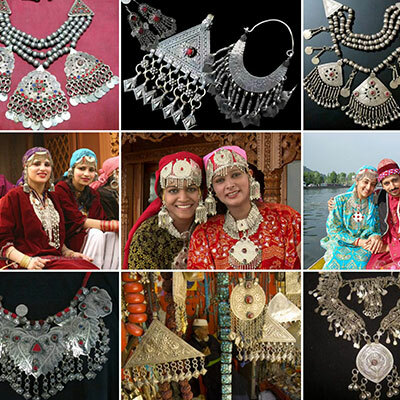 Many of you would agree that Indian jewelry is incomplete without an attractive pair of jhumkas. You can easily perk up even a dull outfit with jhumkas. Have you ever thought of pairing a pencil skirt and tube top with classy gold jhumkas? Or, think something different and wear your gold loops with a high waisted pencil skirt. This hot look should definitely be on your try list! If you seek comfort along with style, then you could also try pairing gold jhumkis with a simple jumpsuit. You can also wear gold danglers with a jumpsuit. Needless to say it is a perfect bet for a get together with friends or family. Isn’t it? We know that earrings are undoubtedly the favourite piece of jewellery of any girl. One cannot deny that earrings can perk up even the boring outfit. That’s the reason why we suggest teaming up your jhumkas with western outfits. Sonam Kapoor and fashion are synonymous right? Hence take some cues from this this diva… she is seen pairing traditional jewellery with western outfits and it is worth taking note of. Take a cue from her and add a nice pair of jhumkas to your party gowns and even off-shoulder tops. LBD or Little Black dress as they call it is a versatile dress as it is. Adding that perfect Indian touch to this type of western dress becomes quite simple if you have a great collection of gold jewelry as black gold make a great combination. Rock this look at an evening party and be all set to turn heads like never before. If you want to add some bling to your LBD, do so by pairing it with an elegant gold necklace, or a long gold chain. You can team a stunning gold necklace with an off-shoulder dress or a pair of gold earrings with a halter neck dress or sweetheart dress. So what are you waiting for? Just take out that cute dress of yours and flaunt it with gold jewellery.